Barclay Lake is located in the Mount Baker-Snoqualmie National Forest of Washington State, a massive forest which extends from the Canadian border more than 140 miles along the western slopes of the Cascade Mountains. Within the Forest boundaries you’ll find glacier covered peaks, alpine lakes, old growth timber, wild and scenic rivers and abundance of fish and wildlife, not to mention Mount Baker, an active volcano. The Forest offers a host of recreational opportunities and combined with its location it’s one of the most popular forests in the nation. Weather can be unpredictable with the Cascades creating their own weather, so come prepared for fog, rain and snow (higher elevations can receive over 500 inches of precipitation, mostly in the form of snow). Barclay Lake lies within the boundaries of the new proposed wilderness area, called Wild Sky Wilderness and is part of the Skykomish Ranger District. A district which covers 316,522 acres of forest, mountains, sub-alpine meadows and more than 150 lakes, along with112,000 acres of Wilderness and approximately 140 miles of hiking trails. As for the trail, Barclay Lake trailhead is extraordinary. There are great views of Mt. Barring and Merchant Peak from the parking area and there are several waterfalls flowing down off of Heybrook Ridge on the north side of the road. The trailhead is at the end of an old logging road, in a box canyon. Mt. Baring is a well-known icon on Highway 2. There is a climbers’ route for Mt. Baring that also starts from the trailhead, continuing up the old logging road, which is now blocked off. The trail starts out in second growth forest, running parallel with Barclay Creek. Along the way loom many old growth stumps. The trail winds down and twists in and out of stumps, rocks and through mud. Wildlife can be seen along the trail and at the campsites by the lake. 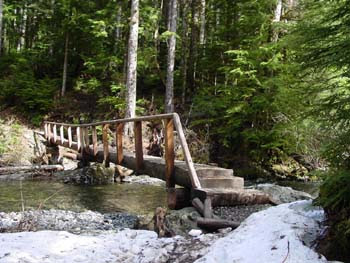 Old cedar puncheon covers most of the trail shortly before the fairly new bridge crossing the pretty green-colored Barclay Creek. There are several places to stop along the creek. The trail climbs slowly up to the lake, with old growth forest along this section of the trail. At the western end towers the north face of Mt. Baring, with an impressive 3,100 foot vertical drop from the top. A logjam at the west end of the lake makes easy walking to bigger rocks, for viewing the lake or Mt. Baring. In late summer, early fall the lake level usually drops quite a bit, leaving a wider shoreline to walk on. The lake itself, is about ½ mile long, with three or four campsites along the shore. The trail travels down the north side of the lake, where there are places to picnic or swim all along the way. Grotto Mountain can be seen from the middle and the east end of the lake. At the end of the lake is an old fisherman’s trail up to Eagle Lake, a two-mile, one-way trip, with 1,500 feet elevation gain. This is a very rough, old trail. Regulations: Motorized and mechanized equipment is prohibited. Maximum party-size is 12 in a group. Short cutting trail switchbacks is prohibited. Possessing unprocessed hay, straw, or raw grain livestock feed is prohibited. Grazing, hitching, tethering, or hobbling any pack and/or saddle livestock within 200 feet of a lakeshore is prohibited. Do not build fires where posted as prohibited. Caching equipment is prohibited. Cutting of standing green trees, snags, and boughs is prohibited. Bury human waste away from water sources. Protect water quality. Pack out litter. Directions: Traveling east on Highway 2, go 6 miles past Index, Washington by milepost marker 41. To Baring, turn left on FS Road 6024, travel through a residential area, then FS Road #6024, begins stay on main road about 4.4 miles in the road ends and the trailhead begins. The Eagle Cap Wilderness lies in the heart of the Wallowa Mountains in Northeastern Oregon on the Wallowa -Whitman National Forest. It was the summer home to the Cheif Joseph Band of the Nez Perce tribe and was used as hunting grounds for bighorn sheep, deer and to gather huckleberries. The Wilderness Act of 1964 placed the area in the National Wilderness Preservation System. It was enlarged through the years and now totals 361,446 acres of Wilderness. 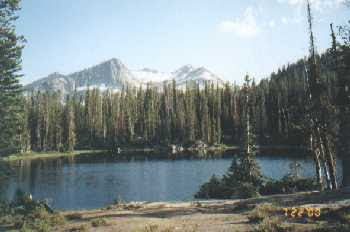 The Eagle Cap Wilderness is characterized by high alpine lakes and meadows, bare granite peaks, and U-shaped glaciated valleys. The Wilderness has an array of exquisite wildflowers, small groves of old growth forest, and a variety of interesting wildlife. In the summer months, white-tailed deer, mule deer, and Rocky Mountain elk roam the Wilderness. Black bears are seen on occasion eating huckleberries and cougars hide out among the rocky outcroppings. On rare occasions, Rocky Mountain bighorn sheep or mountain goats can be seen, not to mention the smaller mammals that inhabit the area year-round including pine martens, badgers, squirrels, and marmots. As for fowls, keep your eyes to the air for falcon, woodpecker, bald eagle, golden eagle, ferruginous hawk, or the gray-crowned rosy finch. Plants range from low elevation grasslands and ponderosa pine forest to alpine meadows. Across the meadows you might spot a variety of Indian Paintbrush, Foregt-me-nots, Columbine, Larkspur, Cow Parsnip, and Mountain Bluebells. As for the trail, from the trailhead stay right and follow the sign marked West Fork Wallowa River Trail #1820. The first ¾ mile section of the trail is steep and junctions with Joseph Mountain Trail. After passing the Wilderness Boundary sign at ~1 mile, the remaining ~2 miles to the Ice Lake junction is less strenuous with good views of Craig Mountain and the river (Note: there are 3 good campsites with water available at the junction). It's another ~3 miles to Six Mile Meadow gaining a total of 1,200ft in elevation from the trailhead and finally leveling out ~1 mile before the meadow (Note: at Six Mile Meadow a person can usually find good access for fishing the West Fork Wallowa River for Brook and Rainbow trout). At the beginning of Six Mile Meadow, there's a trail junction where you will head right towards Horseshoe Lake on Lakes Basin Trail #1810. Trail #1810 cuts through the trees, crosses over the West Fork of the Wallowa River climbing another 1,200ft in elevation over three miles to Horseshoe Lake (Note: there is no water available over this 3-mile climb to the lake from the meadow). Horseshoe Lake has multiple campsites and this documenter prefers to use it as a base camp to explore the rest of the Lakes Basin area or you can continue on to one of the other lakes. Either way, definitely make a visit to Moccasin Lake and Mirror Lake, it's well worth the effort. Fishing is good in most lakes and the West Fork Wallowa River. Camping sites abound, but make sure you follow the forest service regulations and avoid camping within 200ft of the shorelines for all lakes. Bears are common in the basin, so hang your food and follow bear backcountry precautions, not to mention the squirrels and chipmunks like to get into things also. A Northwest Forest Pass is necessary for parking at Eagle Cap Wilderness Trailheads and all visitors to the Eagle Cap Wilderness must obtain a required Wilderness Visitor Permit before entering the area. Only one permit per group is necessary, and there is no fee for the permits. The self-issue Registration/Permit boxes are located at each trailhead near the information board. The Eagle Cap Wilderness is the most heavily used wilderness in Northeast Oregon, with the Lakes Basin Management Area the most popular. With the large size of the wilderness and the extensive trail system visitors should be able to find many opportunities for solitude. To increase your chances avoid holidays, travel on a weekday, in early spring or after Labor Day. NOTE: A ~27-mile loop trip can be made by going up the West Fork, through the Lakes Basin, over Glacier Pass (a fairly steep climb over the Pass) to Glacier and Frazier Lakes, finally returning via the West Fork Wallowa River Trail #1820. Driving Directions: From Joseph Oregon, drive South on Highway 82 following the signs ~6 miles to the far end of Wallowa Lake. At the end of the lake, turn left at the junction in the road and follow Powerhouse Road 1 mile to the end of the pavement and parking area. A parking permit is required. The trailhead is located about 200ft up the hill and to the left of the powerhouse.